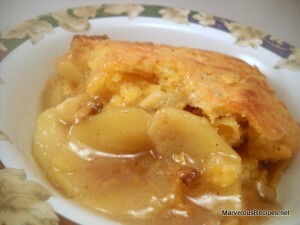 The subtle taste of cheddar enhances the delicious flavor of this mouth-watering apple cobbler. Serve it with vanilla ice cream, whipped cream or (my preference) hot from the oven just the way it is! 1.In a large saucepan, combine 1 cup sugar, water, corn starch and cinnamon. Bring to a boil, stirring occasionally. Remove from heat; stir in apple slices until well coated. Pour into a greased 8-inch baking dish; set aside. 2.In a small bowl, combine the flour, baking powder, salt and remaining sugar. Stir in melted butter and milk just until moistened. Fold in cheese and walnuts. Spread over apple mixture. 3.Bake at 375 degrees F for 30 to 35 minutes or until filling is bubbly. This looks delicious, Emily!! I will definitely give it a try! Thank you for your sweet words about my blog!! You are too kind! Thank you for sharing all of your great recipes!! I love seeing and hearing about all the yummy dishes you have prepared – getting some great recipes for my family!! Our internet server was down over the week-end, so I’m a bit behind on keeping up with everything! I’ve heard cheese goes well with apple pie, but I’ve never seen it actually cooked in. I gotta try it. I just don’t think I can try this. I know it’s a popular combination, but it’s one of those things that I don’t think I could try, lol!